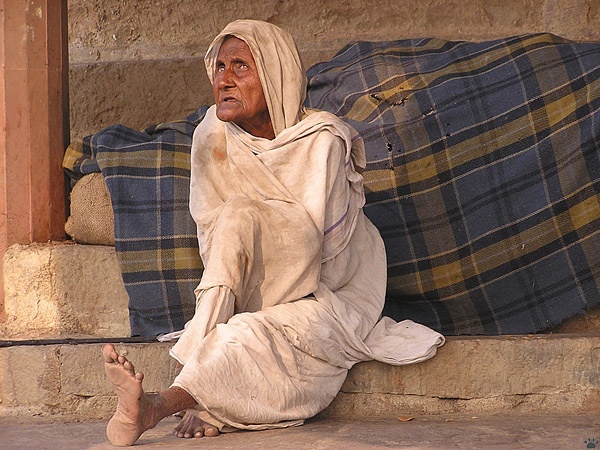 Street beggar, Varanasi, Uttar Pradesh. Your first day in India is invariably a negative experience. I visited it just a few months after traveling in China, and the comparison was not in favor of democracy. While China's "one family - one child" policy has resulted in unprecedented economic boom and, recently, some impressive conservation successes, India failed to implement anything of a kind. Political parties that tried to curb the birthrate have invariably been voted out of power. The resulting population explosion has left the country without any hope of any meaningful economic development or life quality improvement, ever. The environmental devastation is not as bad as in Bangladesh or lowland Pakistan, but still rather depressing. The remaining Nature reserves are under immense pressure from growing population, corrupt politicians, and climate aridization caused by air pollution. 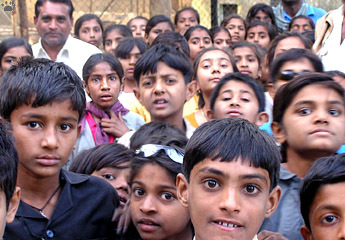 Schoolchildren on a trip, Gujarat. 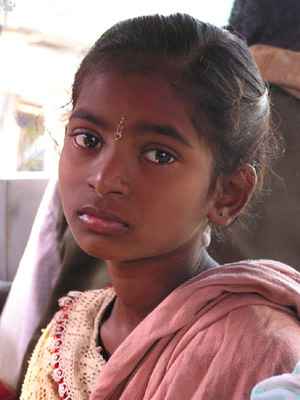 Rajput girl, Rajasthan. 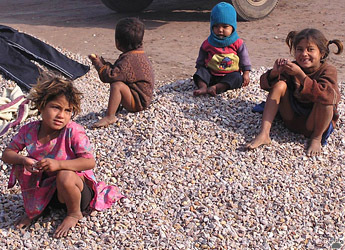 India's population of 1,140 million (and growing by 21% per decade) is 52% male, 74% rural, 25% illiterate, and 10% unemployed. 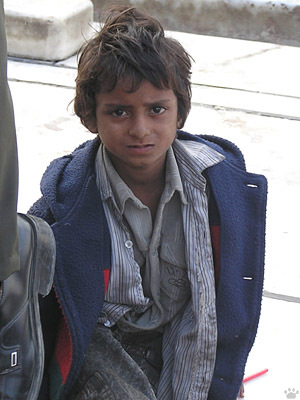 By some estimates, 70% of children don't get enough nourishment, and 20% don't go to school. 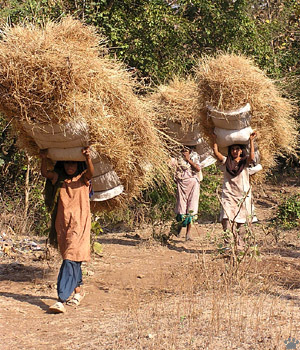 Village women carrying hay, Tamil Nadu. Development is also slowed by religion (an immense drain on people's resources), the caste system, corruption, and interior strife. 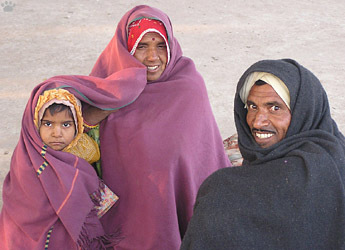 But, despite hard living, people are very friendly, and traveling is surprisingly safe. 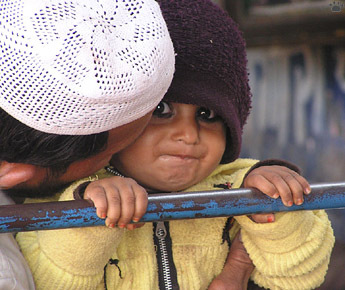 Shopkeeper and his daughter, Rajasthan. of rural houses. Crocodile Bank, Tamil Nadu. India is a very cheap place to travel (you can cross it by train for less than US$40, find a hotel room for $2-3, and a dinner for $1), but don't expect cheap comfort. Even midrange hotels are often less comfy than railway station waiting rooms. Bring a sleeping bag: you'll need it at those stations, in hotels, trains and buses. It would also allow you to buy second-class tickets and sleep in the first-class carriages on the floor. Winter nights are very cold everywhere, except the coast and the far south. 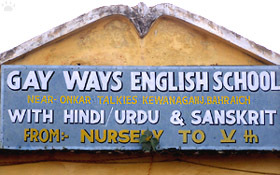 A lot of people speak some English, especially in the south (in the north, Hindi is the lingua franca). 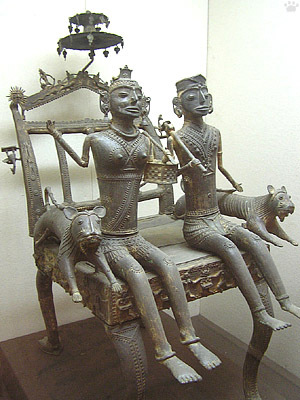 Bronze statue, Assam, c. 1800. National Museum, Delhi. Trains and buses are very slow (often less than 20 km per hour - there are almost no modern highways), always late, and not too comfortable, the distances are huge, but India is worth the suffering. Its cultural and natural diversity is hard to beat. 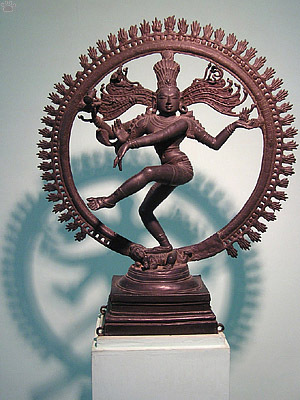 Nataraja statue, Late Chola, Kerala, c. 1150. National Museum. 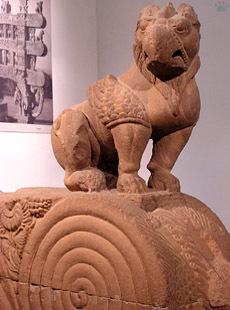 Griffon statue, Sanchi, Madhya Pradesh, c. 100 BC. 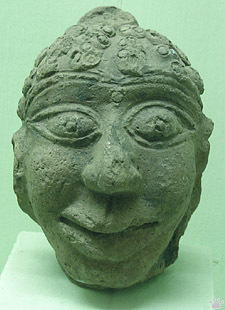 Mask, Ravi River, Punjab, c. 3000 BC. 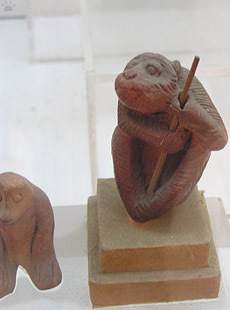 Monkey figurine, Lothal, Gujarat, c. 2400 BC. Warriors going into battle. 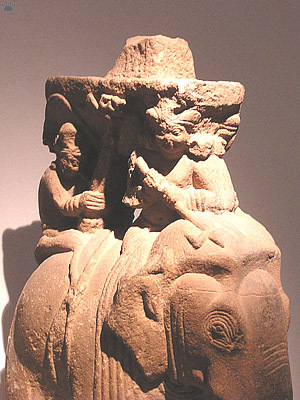 Sanchi, Madhya Pradesh, c. 100 BC. National Museum. 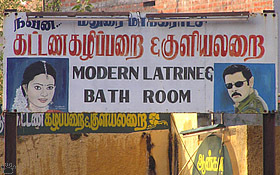 For fifty centuries, numerous cultures have flourished here. The last 350 years have mostly been the time of cultural declines, but India is still full of beautiful art that has somehow survived the ages of neglect and endless warfare. 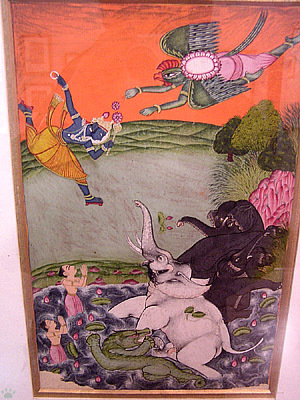 Vishnu saving the king of elephants from crocodile demon. Kotah, Rajasthan, c. 1750. National Museum. Tiger in the jungle. Kotah, Rajasthan, c. 1750. National Museum. 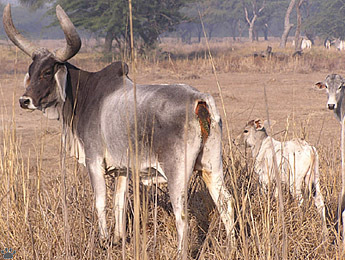 Zebu cattle of Kankrej breed, Sultanpur National Park, Rajasthan. 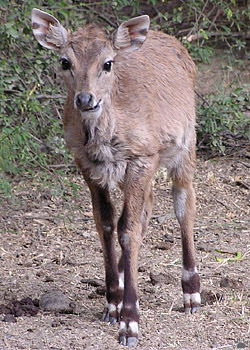 India is an ancient center of animal domestication, and home to some unusual, very ancient breeds. 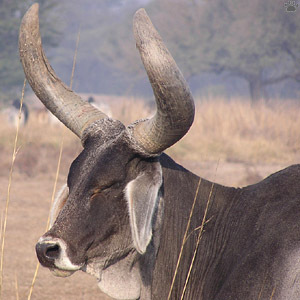 Cattle was probably first domesticated in India - as long as 10,000 years ago. 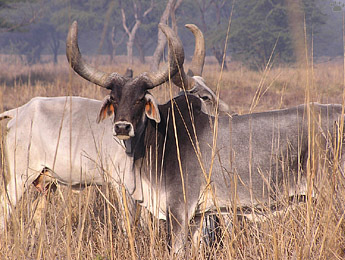 Zebu cattle of Kankrej breed, Sultanpur National Park. 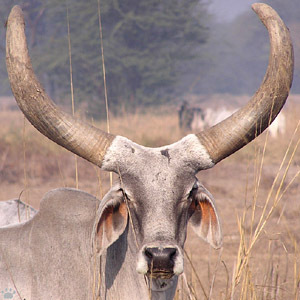 Zebu cattle of Kankrej breed, SNP. 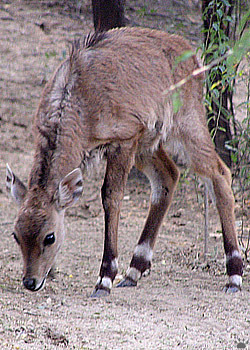 Keoladeo Ghana National Park, Rajasthan. Humans and wildlife have lived side by side in India for millennia. No wonder most stories of children raised by wolves and other animals come from here. But this relatively peaceful coexistence has largely come to an end. Urban sprawl, deforestation, agrochemistry, rampant poaching, and, most of all, overpopulation are decimating Indian fauna and flora. Even national parks are under threat, and a few have been largely destroyed or poached out. But some parks and reserves are still teeming with wildlife, including big cats. its water supply was diverted for farms. 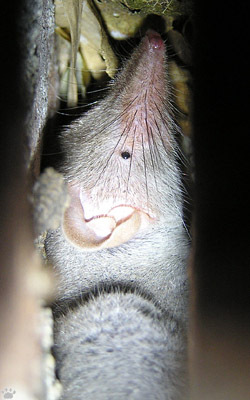 KGNP. 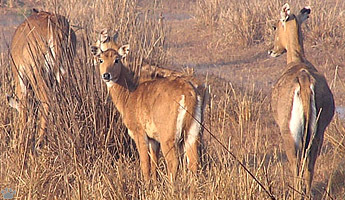 Female nilgai, Sultanpur National Park, Harayana. 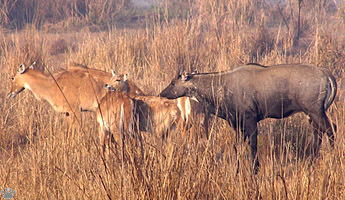 Male nilgai, KGNP. 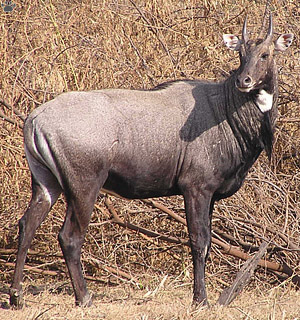 The only large wild animals you see outside protected areas are spotted deer and nilgai antelopes. 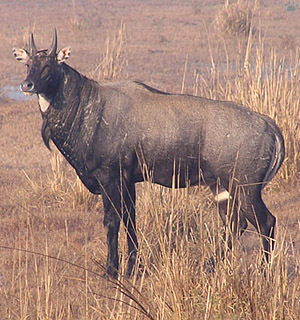 The nilgai are not hunted because they look a bit like cows, the sacred animals for Hindus. 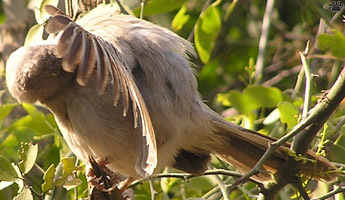 Jungle babbler (Turdoides striatus), KGNP. 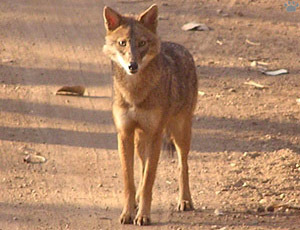 Golden jackal (Canis aureus), Sasan Gir National Park, Gujarat. 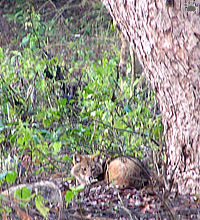 Wolves are now almost extinct in India, but their smaller relative, the golden jackal, is still common in wooded areas, even near villages. 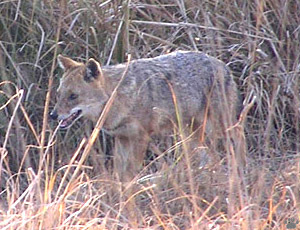 Golden jackal, Corbett National Park, Uttarkhad. 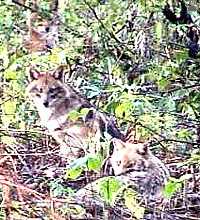 Golden jackals, CNP. 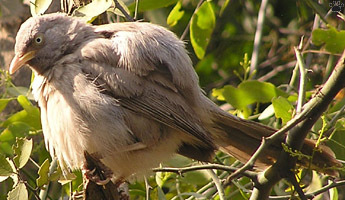 There are lots of animals in Indian countryside, from jackals and mongooses to colorful birds and butterflies. 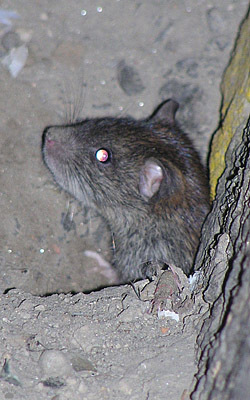 Even if you are not a naturalist, you will probably notice some of them: rats, kites, flies, cows, feral dogs, and ubiquitous mosquitoes. Enjoy their company while exploring one of the world's most fascinating countries. India might make you feel tired, shocked, compassionate, desperate, disappointed, disillusioned, disgusted, even totally exhausted - but never bored. 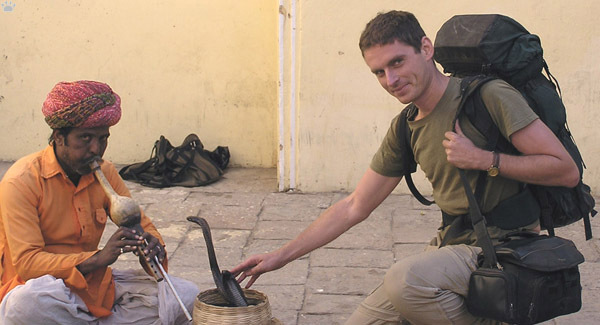 Snake charmer, Rajasthan. All cobras used by charmers have their fangs removed and/or mouths sewn shut. They only live for a few weeks. and are stuck in this profession which is barely profitable nowadays.